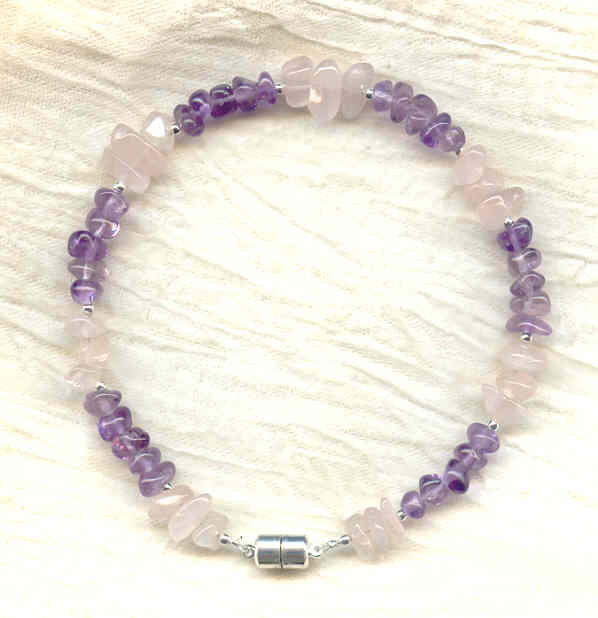 Better even than that, the collar is quite lovely, featuring amethyst and rose quartz pebbles. The amethyst pebbles average approximately 6mm in diameter, and the rose quartz are a bit larger. The two kinds of stone are separated by tiny silver tone beads. The collar measures about 10-3/4" long. The second image is a candid shot caught by chance of that famous athlete, cat-about-town, and noted fashionista, Gorbie (surely you've heard the catchphrase: 'Yo, Gorbie, it's gotta be the collar! '), wearing a similar amethyst and rose quartz collar. About 2-1/8" in diameter, this sparkling brooch pin is a modern take on a vintage look.